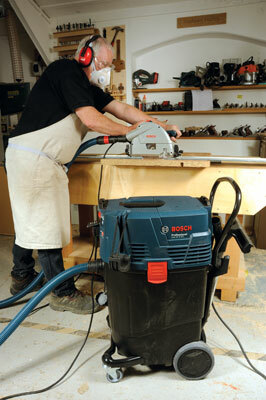 One of things that craftsmen all need, but seldom seem to use, is extraction. Considering the mess and health risks involved, this is strange; there is nothing macho about allowing yourself to get asthma or lung disease. Bosch know this and they also understand, along with other power tool manufacturers, what a big market is waiting if tradesmen everywhere equipped themselves properly for personal safety. The new range of GAS extractors are designed to answer a lot of the problems by delivering complete solutions as part of a system of tools and accessories. 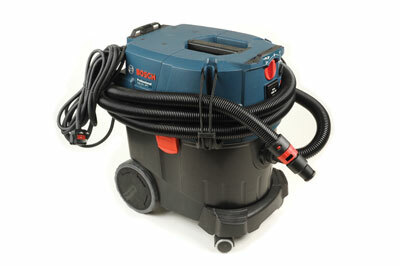 We tried out the GAS 25 L SFC in issue 71, so this time we turned our attention to the new models. These are two of a range of four new models which have similar specs, but represent them all quite well. 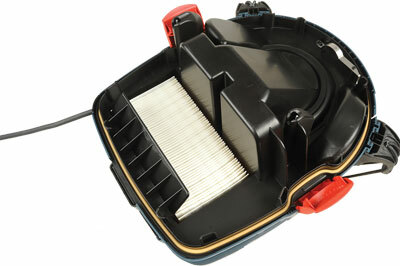 They all have the same turbine motor and assembly, but the differences are in the filter type, filter cleaning operation and dust container size. 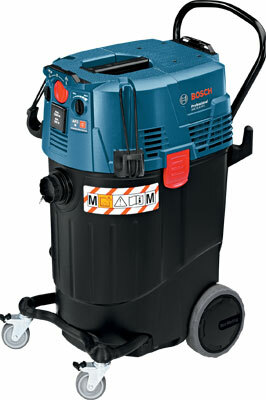 The 35 L has the normal filtration standard which is suitable for woodworking and similar dust-producing tasks, while the 55 M has a higher filtration level for fine building dust, etc. 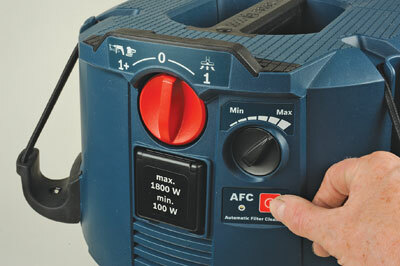 Both have automatic filter cleaning, although there is another version of the 35 L AFC - the 35 L SFC - which has semi-automatic cleaning via a button at the tool end of the hose. 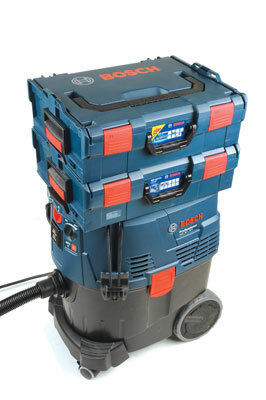 You can select manual or auto-switching for working with power tools. As you work, the filter cleaning kicks in at regular intervals which can sound alarming, a bit like a door banging, but this is your assurance the filter element is being kept at maximum efficiency as you are working. All models are highly manoeuvrable thanks to small swivelling wheels at the front, and large wheels at the rear, designed for going up steps and over minor obstacles. Bungee-type clips finally deal with the knotty problem of stowing the hose! 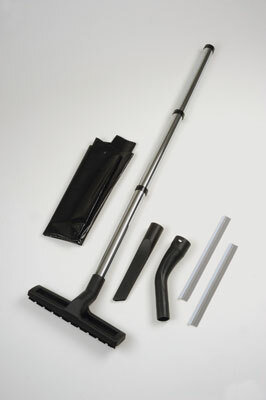 Accessory storage is at the rear with cleaning tools included. A key feature that could easily be overlooked is the fact that these units are compatible with Bosch L-Boxx storage units. This means you can clip power tools or fix compartmented cases on top and wheel the whole thing round when you get on site - so the tools you want to use with extraction can stay with the extractor. Here is an early preview of an amazing L-Boxx variant, the GLI PortaLED. 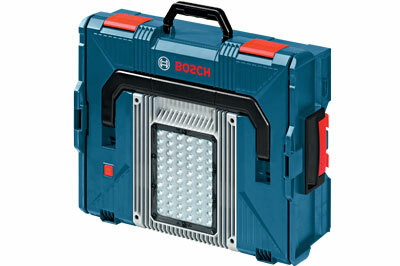 This is no gimmick but a really powerful site light in a case. 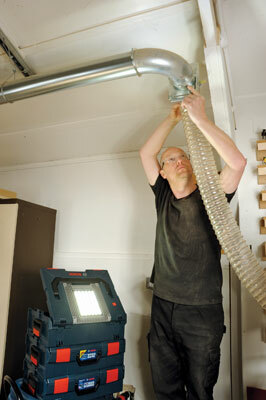 Again, it clips to other L-Boxxs and if you put it on top of an extractor as well, you can get it up to a very reasonable working height for plenty of working light 'off mains' thanks to a 14.4V or 18V Li-ion battery, when you plug it in to the light and still have room to store cordless tools in the case as well. Its 60 LEDs give a really bright output, depending on the setting, and last on charge up to three hours. It is very robust and lightweight and has a long service life.